What goes into creating a convention adventure for Wizards of the Coast? How did a battle interactive come to replace a delve? How well does RPG historian Shannon Appelcline capture Candlekeep’s process and history? I aim to answer this and more in three articles this week. I also draw parallels to 1980s, showing the history of organized play experimentation. This is the final article in the series. Confrontation at Candlekeep had a specific vision and story that made it different from Vault of the Dracolich. This also extended to its interactive nature. It wasn’t meant to be a huge battle interactive (as found in living campaigns), but rather to borrow from those concepts. Where Vault was all about simultaneous exploration of the same area, with reasons for groups to stay separate and trade information and resources, Candlekeep was about separate missions and then coming together for a big simultaneous finish. Because of the low page count, it had to have exciting interactive touches and the feel of multiple tables, but very low complexity. To make the event manageable, we separated players into a ‘pod’ of 4-9 tables. Within a pod, the tables would carry out different events from a menu of options, such that together the pod would carry out all the missions. During the final event, elements were added to allow tables to interact. Those elements went through many changes. The initial design was a bit too far-reaching, causing us to write an event that was too long and complex. 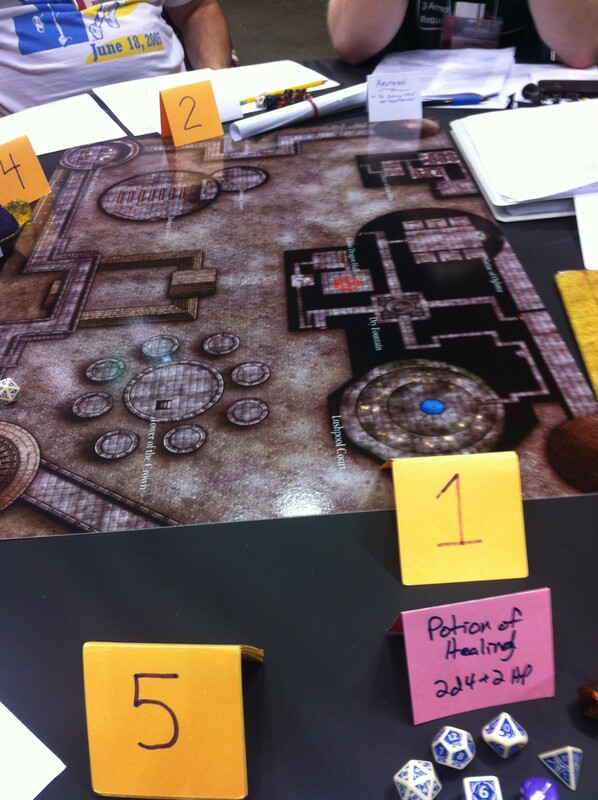 The final combat featured each table at a tower, shielding a monk who tried to complete a ritual to save Candlekeep. Combat elements would encourage players to move across the towers, using magic bridges. Bringing tables together is really complicated (best left to another blog post, but the simplest problem is that when you add players the time each player gets to shine decreases significantly, as does the excitement. DM David has some good thoughts here). Many initial ideas were abandoned, including the idea of empowering ward-stones that could be used to help other tables. There are many issues with that (it can shame tables to request help), and in the end we killed the ideas. Some of the abandoned ideas did keep rattling around in my brain; I incorporated some into the following year’s big Gen Con event, Corruption in Kryptgarden. One of the joys of authoring is seeing player creativity. Early in the Gen Con run we saw a player who, upon the dragon departing their table, asked if his PC could jump onto the dragon. The DMs and First Readers quickly made this a part of the design, asking later tables if any of the PCs wanted to “ride the dragon.” (DMs were encouraged to make their own call as to how hard or easy it was, but generally it just worked and later the dragon could toss the PC back to its original table.) The result was great fun, a nice mechanic for players ending up at other tables, and some really spectacular falls! In contrast to Vault, I think this was a tough project for Shawn Merwin and I to write. Though the end result was great (arguably more fun for many players than Vault), we struggled to find the right balance of interactivity, pace, brevity, complexity, and setting. The first playtests were mixed, with the event being too long. We rewrote portions and streamlined, including moving from three phases to two. 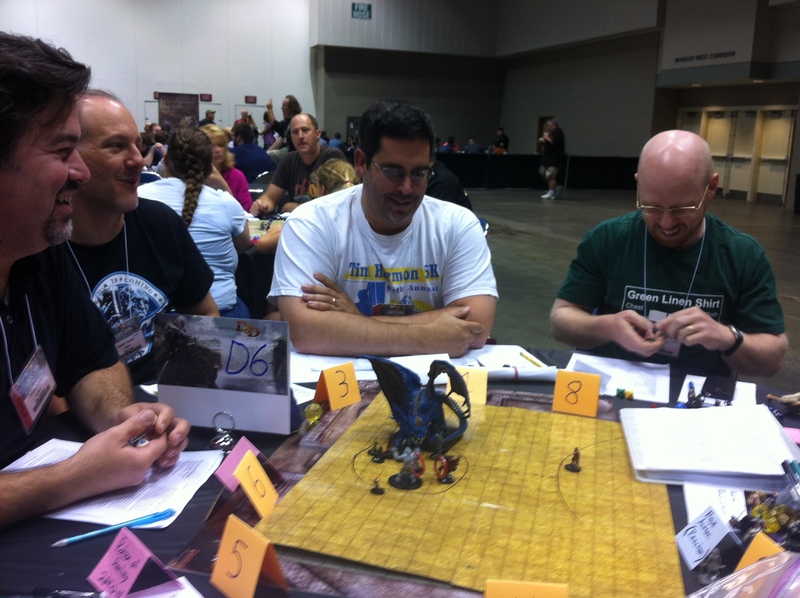 Greg’s development really brought it together, as did our design being DM friendly – it encouraged DMs to make the event their own and to enhance it during play. One of our PAX DMs created this fun handout for the Library of Natural Wonders. Advancing on Vault’s design, Wizards wanted to have several roles beyond a DM, adopting names from Candlekeep’s lore. A First Reader would oversee each pod, coordinating the DMs as in Vault. Because convention play would see walk-up play and long lines, a Gatewarden would entertain the line, explaining the initial premise and encouraging the group to get into character. Their introduction ended with the question, “and what tome of knowledge did you bring as an offering for entry?” That single line sparked a lot of on-the-spot backstory and roleplay as players dreamed up great ideas. DM Adam Hennebeck wrote up all of the books that showed up at their table. You can see the list here. 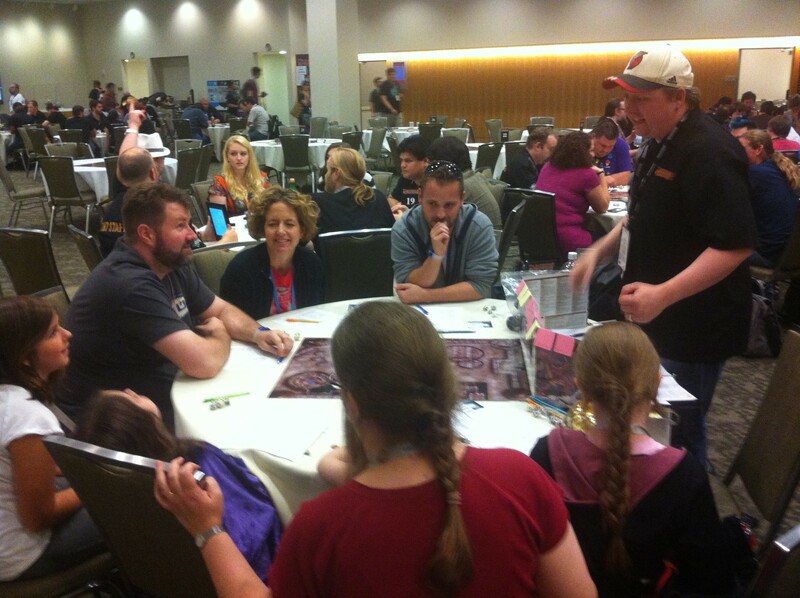 A final role was the Loremaster – a WotC staffer who could answer any rules questions for D&D Next. The First Reader could really ham it up. I played the adventure (it can be great to learn from playing your own adventure!) at Gen Con and we had a terrific First Reader. I then was the First Reader at PAX. You could bring a lot of drama to the tables, painting what they see as they approach Candlekeep and enter its gates, bringing to life the chaos of the attack, and creating dread and excitement when the dragon approaches! DMs had an important role too! From the very beginning, Wizards’ design (shepharded by producer Greg Bilsland) called for line monitors and Gatewardens to offer players the chance to DM the event and skip the line. This did happen, though perhaps not as often as originally envisioned. Because of this, the adventure had to be very straightforward and avoid the complications of many interactive convention events. It was a far simpler adventure to run than Vault, for sure. Roles (which came from living campaign battle interactives, made it into Vault, then into Candlekeep) were also used in the Dead in Thay season of Encounters (written by Scott F Gray, who worked on Vault). I used them, perhaps overly so, in the first Adventurers League Epic at the next Gen Con. On the other hand, the following two Epics made little use of them… and I think could have benefitted from them. The product history remarks that at the time people looked to Candlekeep to see what a 5E adventure would look like, and that the answer was “… unclear”. It is important to note that the style of writing was really something that Shawn and I chose, based on what we thought would work well for an adventure DMs needed to run quickly. Greg had many comments as well, helping us pare down the basics and arrange information so that DMs could run it cold. We also had to work within the low word count, which forced us to be very efficient and not to have a sprawling dungeon crawl with lots of rooms. Choice had to be around missions, not players exploring big areas as they saw fit. We didn’t have the space to describe more. So, it really wasn’t about WotC setting a style as much as project constraints. Vault’s and Candlekeeps approaches have more to do with the event constraints than any other factor. “At that time, we were transitioning as designers from the gilded hole style dungeons of the 1970s to the more naturalistic, context-driven adventures of the 1980s”… “there had to be a reason”… “and a rationale” – Lawrence Schick, in the 2013 forward to Against the Slave Lords, looking back on the 1980 adventure series. The product review also notes “one thing was obvious: Wizards was moving away from the tightly crafted tactical encounters of the 4E era.” I would argue that this was a change that had been happening throughout the 4E era, somewhat of a parall el to what Shick writes in the quote above. Ashes of Athas used mapless combat and open creative encounters, as did late LFR adventures. Dungeon DDI adventures also were moving towards explorable locations, multiple pathways, and more organic player-driven feel vs linear self-contained encounter units. I don’t think that was any one entity, but rather the entire audience (including authors) moving in that direction. It certainly wasn’t something that WotC asked us to do, but something that Shawn and I and WotC naturally favored. Something I have wanted for a long time is to see the Delve change significantly. The Delve had good qualities. It could provide a really fast experience, giving tons of convention-goers a short taste of D&D. This also meant it sold lots of tickets, which is important when a third-party (like Baldman Games) needs ticket sales to make the business work. But, the Delve was always very much a combat bloodfest. It focused on throwing dice and usually lacked any strong story, motivation, interaction with NPCs, or important decisions. Some of us felt that the Delve could, for many player types, fall short as an introduction to D&D. When Wizards mentioned that this would be running “as the delve”, I saw it as an opportunity to make a change. Sure, this would still deliver a fast experience to many people (not quite Delve numbers, but my sources indicate Appelcline’s estimate of 5,000 is solid) but it would also deliver a cool story and RP experience. I think Candlekeep proved you could have a short experience that involved all three pillars of play, had room for creativity, encouraged and left room for in-character interaction, and still had exciting combat. Candlekeep’s success may be why we still see Delve-replacements, such as Shawn’s three excellent Expeditions intros (each delivers a choice of several 45-minute adventures, with a great mix of all three pillars… one even has no fighting at all). My hope is that we never see the old Delve return, though I can’t say whether my desires and those of WotC or Baldman overlap. The product history mentions that Greg was “one of the contributors” to Dragonspear Castle. Greg was critical to all of these 5E adventure efforts in his role as producer. He handled the freelancers, coordinating, reviewing, and often developing their work. His contributions to D&D can’t be overstated, both at a fine level on specific projects and at a high level orchestrating many if not most D&D projects. The product history mentions this was “Shawn Merwin’s first work on D&D 5E, thought not his first D&D work, which included a couple of adventures in 2012.” Shawn is a prolific writer, with few writers being able to match his D&D 5E or 4E freelance efforts. From Dragon and Dungeon to Encounters to 5E convention conversions (such as converting Steading of the Hill Giant Chief), he has an unbelievable 5E resume. His earliest effort with 5E was likely 2012’s Encounters season, War of Everlasting Darkness. His authoring and playtests had to include D&D Next, as it was an option for that season’s play. Around the time he was writing Candlekeep he was also writing one of the sections of 5E’s Dragonspear. His role as admin and author for organized play spans nearly every single TSR and WotC organized play program. The product history could do a better job of giving him credit. The similarity between Candlekeep’s objectives and the designers quoted in Against the Giants really shows that organized play has a tradition of continual experimentation. At times, whole approaches may be shelved or thrown out because of how the game is played at that time, only to come back later – improved for a new edition or changing audience. In experimenting we often end up with imperfections, but those imperfections can be just as educational to authors, developers, and DMs. Here’s to never fully knowing what we are doing. Exploration is as much fun for authors as it is for players! Want more? Here is Merric Blackman’s review of Candlekeep! Designer’s notes like this used to be a standby in print magazines, but rarely seem to get presented on the web. A million years ago, when my copy of the Space Gamer arrived, I would always read any designer-notes articles first. Thanks for giving me a new and fascinating fix. You say Confrontation at Candlekeep proved a tough project to write, and this account gives me an appreciation for the effort. The work goes beyond what I imagined as I spouted off about how such an event should be designed. Speaking of, thanks for citing my post! The project’s tight word count surprised me. I don’t think of an electronic product being pressed to fit a word count. Does WotC’s cents-per-word budget drive that, or do other considerations? The research you lent the project impresses me. I naively assumed every such project included someone with encyclopedic knowledge of realmslore. The plan for folks in line to volunteer to DM knocked me out. We all hear accounts of folks sitting down to an organized play event, and then having it ruined by a poor DM. The vast majority of organized play DMs range from good to terrific, but a few bad sessions lead to a lot of word of mouth. Fourth edition almost seemed designed to prevent a weak DM from ruining a session. The Baldman’s desire to weed out weak DMs contributes to all those player-feedback forms. In that light, luring players out of line to DM seems gutsy. With new players, I want events that give a taste of all three pillars. Potential players interested in D&D typically expect some combat. New players now come from computer games, so role playing feels a bit strange. Too much role playing, and some new players get that deer-the-headlights look. Until that first fight starts, many new players, and some veterans, will look restless, like they want to get past the “background” and start the game. As a DM for new players, I want an easy fight early and a big set piece at the end. Confrontation at Candlekeep did a standout job of giving players a taste of all three pillars of D&D. Thanks, David! I’m glad you enjoyed the articles. On word count, there is always a word count maximum, which you can miss with good reasons (I usually exceed mine and I always try to explain why and suggest which parts can be cut to hit that word count if they so choose… so far they have never cut the extra unpaid words). Usually it does seem to be budgetary (or for DDI, around space allocation per issue), but in this case I think it was tactical around this being easy to run. In Living Greyhawk it was a constant issue that invested and established players would push new people around or outshine or out-lore them. It was hard not to do, but events didn’t help. Since that time most of us veterans keep that in mind. People in charge of today’s organized play programs take several steps to keep that from happening. In interactives, a big problem was experienced players who could take on big challenges, while new players could not. For Candlekeep we wanted to design it so that didn’t have a big impact. Part of that was not providing experienced players with a commodity resource as part of the interactives, which is what ward-stones could have become. I’m a big researcher, and many writers I know are as well. But, it is somewhat a waste of time. None of my FR projects have felt like I had to walk a minefield between canon. It’s the reverse… I ended up wanting more, such that I could expand upon that depth and reward people who knew it… but there wasn’t much canon at all. It’s funny how in three novels maybe 30 pages dealt with Candlekeep and none of those pages helped me write this adventure or established anything concrete. It’s random rooms, monks, candles, books… obvious stuff. Yeah, I wouldn’t have gone for bringing DMs out of the line either. But, I suspect that what was really happening was that a gaming group would show up, and the DM of the bunch would say, sure, I’ll run this to jump the line, and the group all knows her or him and off they go having fun. You know, with 4E I did see people show up and they didn’t want roleplay. But with 5E (and I say this loving 4E), they do RP. The people I least expect to are suddenly coming up with creative ideas and acting in character and doing all sorts of great stuff I think only a veteran RPG player would do. I think that’s core design driving that. Adventures do help… I’ve seen Shawn’s intro adventures really draw people into this kind of play and they seem like experts until you remember they borrowed dice and this is their first time! I find all of your commentary and insight into adventure creating fascinating. While DDI had a number of backdrop and informational articles (later solely being published in Dragon), I found that the adventures were always extremely interesting and could really get the brain going more creatively. Sample maps and encounters just seemed to fire neurons off in a different sort of way. That being said, attempting to write adventures and pitch them is an entirely different animal. Writing a pitch for a Dragon article, then writing that article, seemed relatively simple compared to the requirements Adventurer’s League had. Not that those requirements were bad; if anything, they made me really push myself and work within constraints while also trying to submit my best work. Adventure writing, especially for organized play, just seems like a different animal entirely. Thank you for trying to get more information to throw little Easter eggs out to the players that would pick up on such things. Fans always get excited about obscure in-world references, and seeing you trying to continue it hear speaks volumes. Thanks, Karl! I suspect the AL admins are trying to really push people because there is a high volume of interest and only a few slots a year. The sad truth is also that many people, even people you personally know as an admin, will suddenly back out on a project or otherwise fail to deliver. The hardest part of the work is the clarity of writing so that you do inspire people with the adventure. But, keep trying. Read all the AL adventures you can and see how the words come together to make a great scene. The more you do that, the better your submissions. This entry was posted on November 6, 2015 by Alphastream and tagged 5E, Authoring, Conventions, Forgotten Realms, Gen Con, Mapless Combat, RPG History.